The field of energy work is vast and varied. As there is a constant flow to energy itself, it is forever morphing. Each person who works with energy has their own unique experience with it; what they feel, how they perceive it, how they choose to work with it. Modalities abound. Yet, in this ever-changing realm of energetic vibration, no matter what the chosen modality, some things remain constant. 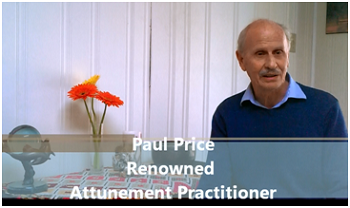 In the following video clips, Paul Price will share his chosen modality; Attunement. These are the techniques that were taught to him, over 45 years ago and which he has continued to practice and refine. Paul is among the few renowned teachers, in the world, who carry the legacy of the Attunement Process and are passionate about passing that legacy on. In this first of two parts, Paul will explain and demonstrate a typical Attunement session, focusing on the body’s endocrine system. Short and sweet, sit back and learn from the masters! In this second video, Paul finishes the Attunement session and explains what drew him into the wonderful world of Attunement. Having been introduced to Attunement first by Nancy and then having the experience with Paul as well, all that I can say is….WOW. It has brought such balance to my life. You are both so amazing! You not only have a gift ….you are a gift. This is great I was train and introduce to practice attunement last year when a visit joy Ville community by Marsha I always love the connection with the vibrational healing . I love to have such a fillings again. Thanks to Joy Ville community you are angles on earth. I love you all.